Wondering how to paint a dresser? This easy DIY tutorial walks through painting a dresser with the best spray paint for wood furniture. I used to be nervous to paint furniture. But I swear, once you get started painting, you find yourself looking around the house to see what else could use a fresh coat of spray paint! First up on the project list though, painting the dresser! Kalen has had this dresser forever. We’ve talked about painting it for a while but with the kitchen renovation, we just hadn’t quite gotten around to it – until now! We have lots of black furniture throughout the house (quite a few pieces that we’ve spray painted! ), so we wanted the dresser to match. If you’re worried about how to paint a dresser, don’t be. It’s really pretty easy! My favorite spray paint for wood furniture is this paint by Rust-Oleum. It’s easy to use, and it works on any surface – wood, metal, plastic, masonry, you name it. I used fine sandpaper roughen the dresser a bit without scratching it. This helps it absorb the paint. Use a damp cloth to wash off the dresser and get rid of any dust or dirt. I pulled a tarp on the driveway to catch any mist from the spray paint. 3. Remove the drawers and line them up with the fronts facing up. You’ll paint the drawers separately from the dresser frame. If your dresser has hardware on the drawers, take it off and set it aside so you don’t have to worry about ruining it while you’re painting the dresser. 4. Start painting the dresser! Move the spray paint can back and forth, slowly moving from the top to the bottom of the dresser. Keep the spray paint can about 8 inches from the dresser while painting. 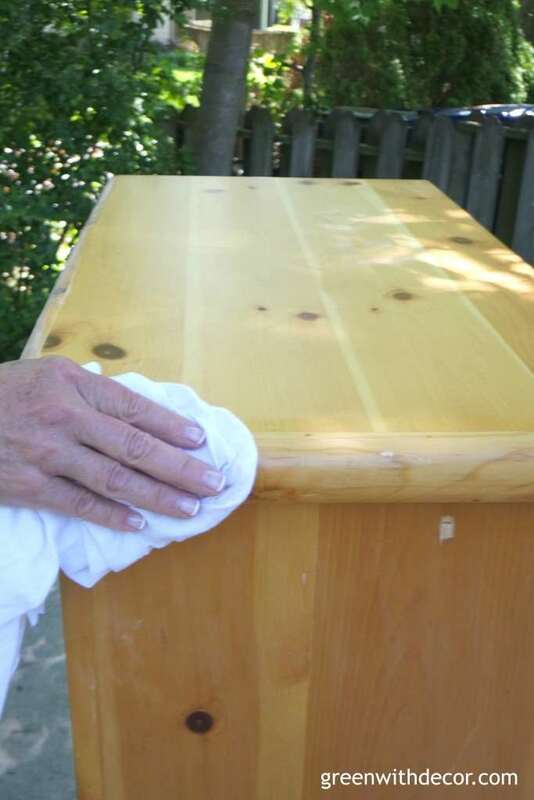 Remember to keep the can moving while painting the dresser so you get even coverage and avoid any drip marks. The paint really is easy to use – even if you’re nervous to start painting! There’s a reason it’s my favorite spray paint for wood furniture! With the sun shining and warm temperatures, it finally felt like summer in Wisconsin this weekend! 5. 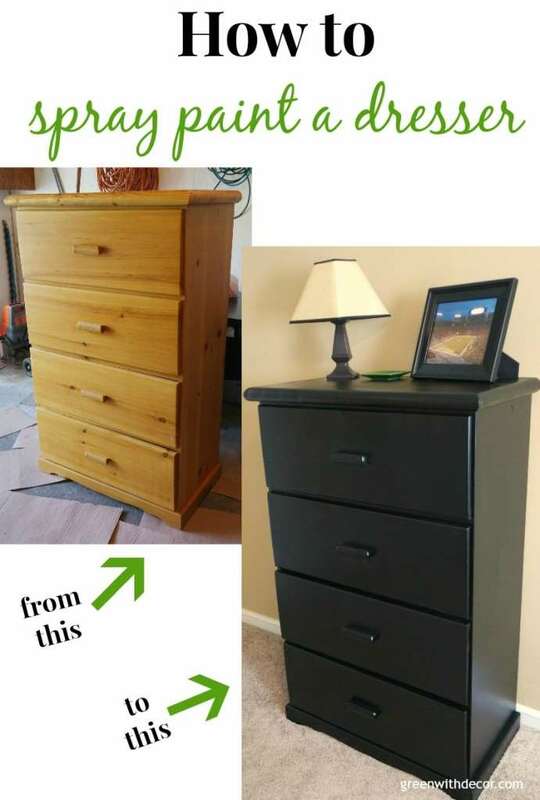 Paint the front of the dresser drawers the same way. You’ll want the drawers face up so you can apply the paint as evenly as possible. 7. Do a second coat on both the dresser frame and the drawers. 8. Let the paint dry, and put the drawers back in the dresser. Spray painting is such an easy way to upgrade the look of a furniture piece. Have you spray painted anything lately? Ready to paint a dresser for a whole new look? Do you have a favorite spray paint for wood furniture? It really is addicting once you start! We put the painted dresser up in our guest bedroom. Wow, it looks great with spray paint. Makes it so much easier. Shared your post. What a difference! Love that paint can do SO much! Great piece. It looks great! Such an improvement! I don’t do much spray painting. I love to brush paint – it’s so relaxing for me. I do love the transformation though – so I may try it on a piece of furniture. Thanks for the tips. Thanks, Cathy! Good luck painting! The next time I paint something, I’m definitely using spray paint, because painting is for the birds!! Go for it – spray painting is a fun, easy way to update a piece! Good luck spray painting – it’s an easy way to update the look! I’ve recently become a little obsessed with spray paint! But the weather has not been kind to allow me to spray paint, as of late. This reminded me that I have a garage full of items awaiting their fresh new paint. Great job on your dresser! Thanks, Alisha! Once you start spray painting, it’s addicting! Hopefully the weather changes soon so you can spray paint! It turned out great! I have a dresser that I need spray paint. I always forget that spray paint can be used on furniture and not just small items. Thanks, Miranda! Good luck with your dresser! This looks amazing! I just bought some Rustoleum (oil-rubbed bronze) to redo my outdated brass doorknobs. I’ve never spray painted before, but I’m excited to try it! I didn’t realize you could do a whole dresser this way. Well done! Thanks, Brittany! Love Rust-Oleum! Good luck with your door knobs – what an easy way to give them an updated look! I have been SO happy to find spray painting furniture tutorials! Painting furniture is difficult and spray painting can help it be so much easier! Rust-Oleum has tons of spray painting colors available. Good luck painting your dresser! I have been toying with the idea of painting my son’s dresser red and blue for a superman theme. This post makes it seem more doable! Go for it! What a cute idea! 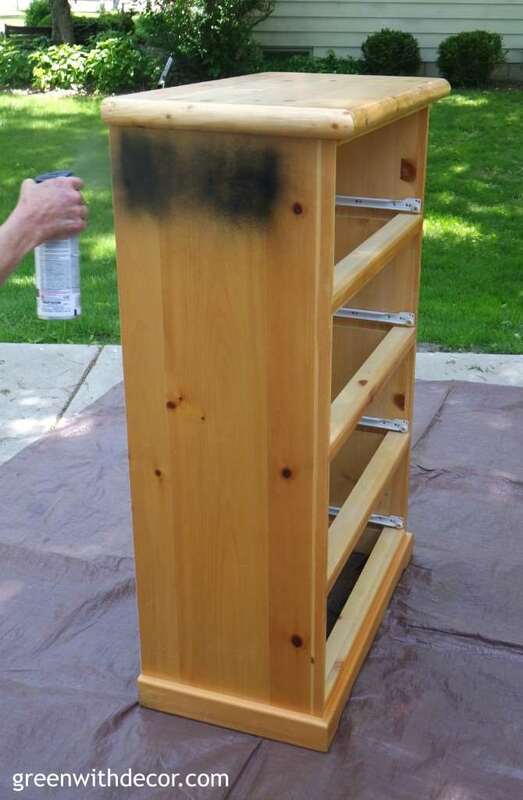 I’ve never tried spray painting furniture, but it looks like this product works great. I love that the primer in it already. Thanks, Colleen! I love this paint! Great tutorial! What a fun and simple way to freshen up furniture! Thanks for the tips!